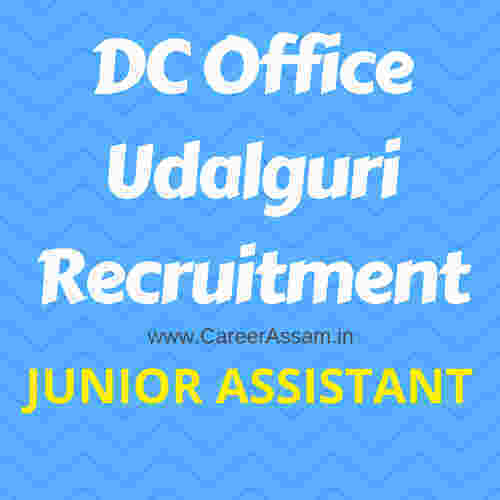 Any graduate candidate can apply for DC Office Udalguri Recruitment 2017 for Junior Assistant posts. 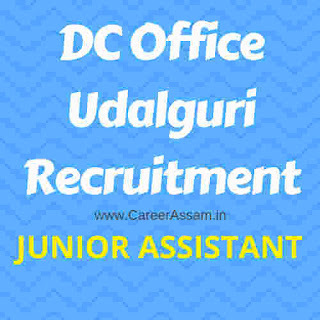 This vacancy is advertised by Udalguri DC Office for various posts of Junior Assistant for eligible and interested candidates. If you are interested in Junior Assistant Job then apply on or before the last date as given below. You should apply on the standard application form. Please read this article till the end to know details eligibility criteria, application process and selection process for the DC Office Udalguri Recruitment 2017. 30% reservation for women will be filled up as per Assam Woman (Reservation of vacancies in Service and Posts) Rules, 2005. Reservation for person with disability will be covered by OM No. ABP 144/95/110 dated 05.11.2011. The applicant must be Graduate from a recognized University with basic knowledge of computer like MS Word, MS Excel and Power Point Presentation etc. Age should not be more than 38 years and not less than 18 years as on 01.01.2017. Provided that in the case of candidates belonging to special categories, the upper age limit shall be subject to such relaxation as may be made by Government from time to time. I have mentioned above that application for this job is Offline. The name of the applicant mist be registered in any Employment Exchange and detail of registration is to be quoted at,the appropriate column of the application form. The application should be addressed to the Deputy Commissioner. Udalguri, P.O-Udalguri, PIN 784509. District-Udalguri. 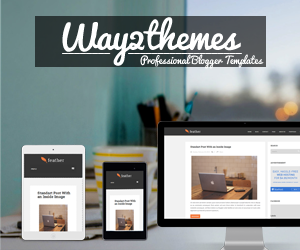 Assam and the envelope containing the application should be superscribed mentioning the name of the post applied for. A self addressed envelope affixing postage stamp worth Rs. 5.00/-, 3 (three) copies recent colour Pass Port size photographs, self attested copies of all educational/other testimonials are to be enclosed along with the application. The successful candidates of written test will be called for Type writing and Computer proficiency. The date for test of proficiency in Type writing and Computer shall be advertised and call letters will be sent to successful candidates of written test. The written test will consist of General English, Essay writing, precis writing, drafting and general knowledge. The successful candidates of written test will be called for Type writing and Computer proficiency. The date for test of proficiency in Type writing and Computer shall be advertised and call letters will be sent to successful candidates of written test. Venue for written test and computer test will be notified through website udalguri.gov.in and by affixing in Notice Board of D.C’s Office Udalguri and communicated to the applicant by post. List of candidates for written test will be notified by affixing list on Notice board of the D.C’s Office Udalguri and the website udalguri.gov.in and separate call letter will be issued also in this respect. List of candidate called for the Interview will be notified by affixing list on Notice board of D.C’s Office, Udalguri and the Website.